Founded in 1968, CenturyLink (CTL) started off as a regional telecom company. Thanks to a series of large acquisitions over the years, CenturyLink is now one of America’s largest telecom services provider with more than 10 million customer connections in nearly 40 U.S. states. In November of 2017 the company completed its $34 billion acquisition of international internet service provider Level 3 Communications. That acquisition increased CenturyLink's fiber optic cable network by 200,000 miles, including in 350 global cities (in 60 countries), connected by 33,000 miles of subsea cables. Thanks to the acquisition of Level 3, CenturyLink will now be a far more business-oriented organization. In fact, the new larger CenturyLink will be the second largest enterprise internet provider in the U.S., second only to AT&T (T), with legacy voice services declining from 43% of revenue to just 29%. 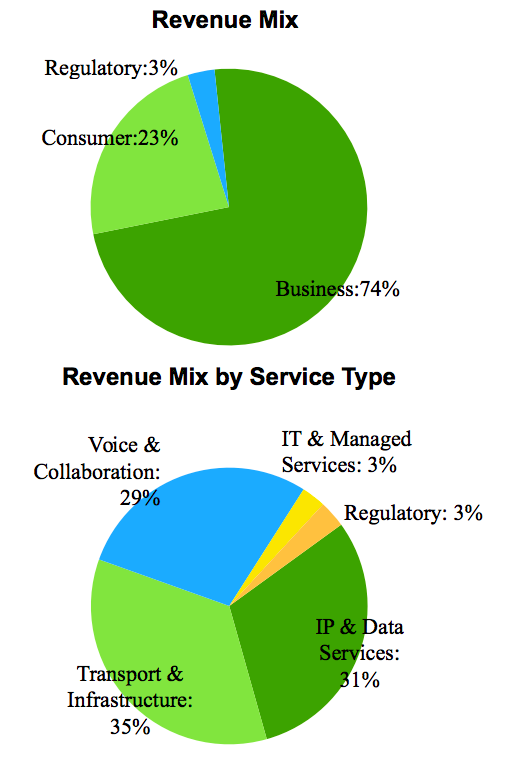 Note that CenturyLink has declared that only its strategic services and legacy services represent its "core businesses," which collectively make up 95% of pro-forma 2017 sales (including Level 3's 2017 results). Another 5% of sales are from "other" operations, including some remaining data integration (data centers) services that the company has already sold and won't appear on next year's financial results. However, the problem for CenturyLink is that telecom is an industry where scale, while a critical factor in achieving good profitability, is hardly sufficient. That's because much of what these acquisition brought it were legacy wireline phone services, which have been in secular decline for years (double-digit sales declines) as wireless phones have replaced the need for landlines. This has created an unenviable position in which CenturyLink merely piled on declining assets onto its own troubled landline business, which has seen steadily falling subscribers result in eroding margins and cash flow. CenturyLink has attempted to pivot into becoming a major internet service and cable provider, and management even invested in the booming data center industry as well. However, the company has faced major problems in this area. For one thing, data centers are a highly specialized business that has not panned out for most telecoms who entered the space. This is because margins are far lower, and rising competition has only increased pricing pressure. This is why telecom giants such as AT&T and Verizon (VZ) have both either sold or announced plans to sell their data centers. In 2016 CenturyLink followed suit, with a $2.15 billion sale of its data centers, representing a $350 million loss. The next problem is that in recent years more and more consumers have been "cutting the cord" and ditching pay TV in favor of lower cost streaming subscription alternatives. The good news is that streaming requires a fast and reliable internet connection. However, only about 35% of CenturyLink's internet offerings are 40 Mbps or faster, the minimum speed required for streaming high-quality video on demand. In addition, the acquisitions it has made have largely put it in urban markets where fierce competition from large cable companies (Cox, Comcast, Charter) have meant very little pricing power. This growing competition is why CenturyLink's internet subscribers have been steadily declining, including a 4.8% drop in 2017 (while landline phones customers fell by 7.3%). So in 2016 CenturyLink decided to make a very strategic move, with its $34 billion merger with Level 3 Communications, who is far more focused on enterprise IT solutions. The margins on this business are slightly lower, but its much higher switching costs mean that existing customers are less likely to move to competing offerings. 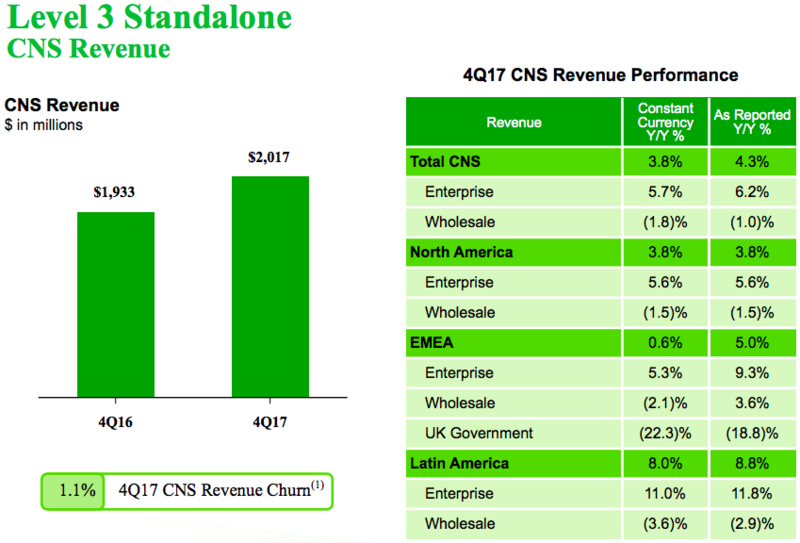 The acquisition of Level 3 meant that CenturyLink could greatly diversify its sales, earnings, and cash flow away from declining legacy landlines, and also gain access to fast-growing international internet markets in emerging economies. For instance, Level 3's international enterprise service revenues grew by about double digits in 2017. Thus this represents a much needed growth catalyst for CenturyLink who has seen its top and bottom line decline for the last four years. Another benefit to the deal is that several key Level 3 executives (with far better track records than their CenturyLink peers) are now joining CenturyLink's executive team. This includes Level 3 CEO Jeff Storey who will become CenturyLink's new COO, and Level 3 CFO Sunit Patel who will take over that role at the combined company. Importantly, because the Level 3 merger is immediately accretive to free cash flow (FCF), CenturyLink expects its 2018 FCF to jump significantly, causing its projected FCF payout ratio to decline from more than 130% to about 70%. Note, however, that this includes Level 3 merger integration costs, which were about $435 million in 2017. Adding these costs back in (assuming that 2018's integration costs are about the same as last year's) brings Century Link's actual FCF payout ratio to about 80%, which seems to indicate that the dividend could be safe for the time being. However, that doesn't mean that this high-yielding stock is actually a good long-term income investment. The new and improved CenturyLink still faces immense obstacles in the coming years, which still make a large dividend cut more likely than not. The good news is that CenturyLink's acquisition of Level 3 should, at least temporarily, help increase its dividend safety. If CenturyLink can achieve its expected $850 million in additional synergies, then its free cash flow would rise north of $4 billion and its FCF payout ratio would decline to less than 60%. 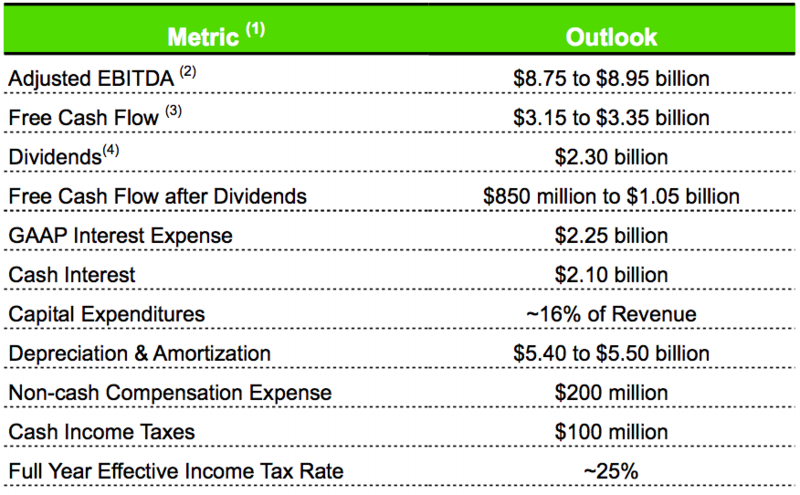 However, there are two major reasons that CenturyLink's dividend remains highly unsafe. First, synergistic cost savings are not guaranteed. While Level 3 has a relatively good history of achieving its cost saving targets post acquisition (under Jeff Storey, the new COO of the combined company), CenturyLink's track record is far worse in this regard. Second, a significant amount of Level 3's impressive FCF is due to its remaining $10 billion in legacy net operating losses, which it has been rolling forward to reduce its tax expenses. This effectively acts as a tax shield that boosts its bottom line but will one day disappear. Next, and most importantly, CenturyLink’s legacy phone businesses are likely in a permanent decline and will probably continue to weigh on the combined companies top and bottom line. For example, in 2017 CenturyLink's core businesses saw a 7.2% decline, with Q4 2017 core sales declining by 8.4%. This was not just because its legacy phone business continues to accelerate in the downward direction (11% decline in Q4 2017), but even its strategic business (internet and cable TV) saw 4.6% and 6% declines in full year 2017 and the fourth quarter of 2017, respectively. While it's true that Level 3 saw relatively better growth in 2017 (about a 2% sales increase), the combined company's top line saw sales still fall 2%. Worse still, margins continue to contract, a trend that isn't likely to turnaround anytime soon, if ever. For example, in 2010 CenturyLink enjoyed 50% EBITDA margins, which have now fallen to 37% in 2017 (for the combined company). Analysts expect these to contract further to 35% by 2022. This is largely because enterprise internet services, while still growing, have become far more competitive in recent years. Cable companies like Comcast (CMCSA) and Charter (CHTR) have also been pursuing more enterprise customers. And since they overlap with 90% of CenturyLink's customer base, these companies have been stealing market share for years, thanks to faster and more reliable broadband and DSL networks. Going forward, CenturyLink's competitiveness in terms of speed and quality of service are expected to fall behind its better capitalized rivals, who can afford to invest far more in their networks. Then there's the issue that even Level 3, while a far better run company than CenturyLink, isn't exactly a major growth catalyst. The enterprise ISP business, while relatively fast growing, is monstrously competitive. Level 3 faces major challenges in the U.S. competing with giant rivals such as AT&T and Verizon (VZ), who are also struggling with growth and looking to expand their enterprise businesses. And overseas, Level 3 is similarly a small fish compared to giant global conglomerates such as Vodafone (VOD). Also keep in mind that major disruption could be coming to the telecom sector, in the form of 5G wireless internet. This is expected to start arriving in 2019 and 2020 and could allow 1 Mbps wireless internet speeds that would potentially make telecoms giants such as AT&T and Verizon the new kings of internet service. This potentially bodes poorly for local oligopolists such as cable companies and CenturyLink, whose 450,000 miles of fiber optic cable might end up proving far less relevant in the future. Simply put, combining Level 3's growing cash flow with CenturyLink's declining businesses means that the expected giant boost to FCF seems likely to be far from guaranteed (management has a terrible track record of delivering on guidance since 2015) and more temporary in nature; the overall negative growth trend is likely to continue. In addition, the company's large net debt load (took on $10.2 billion in debt to fund the merger) now stands at $37.5 billion. And that doesn't even account for CenturyLink's large underfunded pension programs ($1.8 billion in net liabilities). The new company's leverage ratio (Debt/Adjusted EBITDA) has now ballooned to 4.3, which is nearly double the industry average. If synergies are successful, this ratio will fall to 3.7, which is still very high. Management has said that paying down debt will be a top priority going forward. The good news is that Jeff Storey's tenure at Level 3 saw him reduce that company's leverage ratio from 7 to 3. This likely indicates that as COO of the new CenturyLink, the company's balance sheet is likely to become a lot safer than it is currently. However, that's not necessarily great news for high-yield investors, because one of the easiest ways to pay down debt quickly is by slashing the dividend. For example, by cutting the payout by 50% CenturyLink would free up over $1 billion a year in cash flow which could allow it to repay debts at about the rate of $2 billion (or about 5%) a year. In other words, with the new CenturyLink's FCF likely to continue declining steadily over time and interest rates now rising (CenturyLink has a junk bond credit rating), the company may have to follow the leads of peers like Windstream (WIN) and Frontier Communications (FTR). In recent years, these troubled regional telecoms have cut their dividends by 100% and 62%, respectively. Overall, CenturyLink's mega merger with Level 3 appears to be a sensible, if not somewhat forced, strategic decision. It certainly looks far better than the company's previous acquisitions, which mostly piled on vast amounts of declining landline assets to its own troubled landline network. However, Level 3 is hardly a panacea of earnings growth itself, especially as the global telecom market increasingly becomes a cauldron of rising competition and high capital investment and maintenance costs. At the end of the day, CenturyLink's perennially precarious dividend remains highly unsafe and not suitable for a conservative income portfolio. Long-suffering CenturyLink shareholders had good reason to cheer the Level 3 merger, because it appears to be a wise and much-needed strategic shift for the company. It also brought with it two high-quality executives whose track records are far superior to anything CenturyLink's C-suite had to offer. However, while Level 3's assets could go a long way to stemming the long-running decline in sales, profits, and free cash flow, they are not likely to eliminate it entirely. That is, the temporary fall in the dividend's FCF payout ratio isn't likely to last. And given the company's potentially dangerous debt load and the new COO's ambitious plans to deleverage as quickly as possible, CenturyLink's dividend remains a substantial liability it can ill afford going forward. Management hopes to maintain the payout, but the margin for error is extremely slim with this turnaround story. Thus anyone considering owning CenturyLink needs to understand this is a very high-risk income investment, one whose payout is likely living on borrowed time.